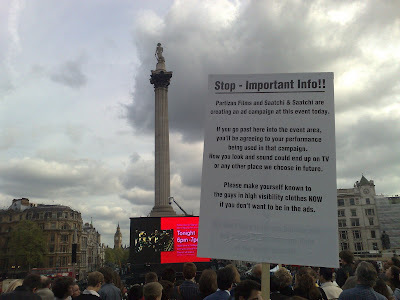 T-Mobile have been making their latest 'Life's For Sharing' ad in Trafalgar Square in central London. 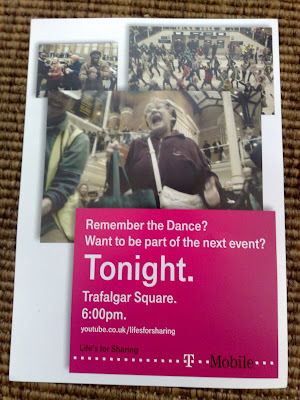 Hot on the heels of the dancing flash mob at Liverpool St station, thousands of people attended Trafalgar Square tonight to take part in the filming of the new T-Mobile ad - Flash mob karaoke. The event was basically a giant karaoke hosted by Vernon Kaye and including a mass crowd in 'the making of' video is a great way of creating buzz and anticipation for a TV commercial before it airs. 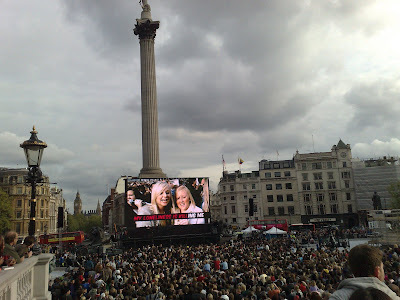 T-Mobile Trafalgar Square - big screen karaoke with thousands of people! Great stuff - was there around 5+ but decided not to wait around as had to rush somewhere else . pity! i was there! managed to get into the square itself and was filmed singing along to "Hey Jude" at the end! was an AMAZING experience!Pink was a nice suprise too! Cant wait to see the ad! Good footage Nick - Nice one! I know what I'd do as the next phase - but I'm not going to share it! ohhh... The old TEASE tactics... Im liking it. Will definitely keep my eyes peeled.